Keep calm and get married. It sounds easier than it is. Weddings are often a roller coaster ride from the proposal on – and the big day is often no different. No matter how much you schedule, plan, or micromanage your wedding day, the truth is, there will always be hiccups along the way. Somebody will inevitably forget all of what you need for a wedding, spill a drink, chip a nail, snag their pantyhose, miss a step getting ready, etc. That being said, a prepared bride is a happy bride. Stay ahead of any potential wedding day catastrophes by putting together all of your wedding day essentials in a DIY wedding survival kit. 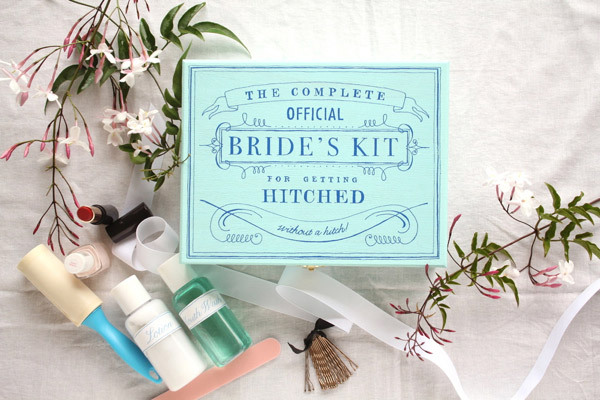 Assign the responsibility of keeping track of this wedding kit to someone you trust, like your maid of honor or best man. This wedding DIY survival kit should include items for avoiding crisis before the wedding and throughout the ceremony and reception. Sound impossible or overwhelming? It’s not! For your convenience, we have compiled a great wedding emergency kit checklist right here to help you shop for and pack your kit. Advil/Aspirin/Tylenol – or any other pain reliever. Alcohol – If you drink at all, pack a couple of airplane bottles of your favorite liquor to have on hand for nerve-calming and liquid courage. If you don’t drink, pack an energy shot and some chamomile tea. Baby powder – Great for fighting against the chafing of that fancy dress against particularly sensitive skin. Also a must-have for absorbing excess moisture. Breath mints or spray – For obvious reasons. You want that first married kiss to be sweet and fresh! Chalk – White chalk can hide a multitude of last-second stains and other sins that won’t come out via other methods. Cotton swabs – These little miracles are a big necessity for detail touch ups. They’re especially good for no-mess touch ups of your makeup. Deodorant and perfume – This is an especially important item on the wedding emergency kit checklist if you are having an outdoor wedding. Plus, someone always forgets. Extension cord with power strip – Suddenly, having 6 phones, 2 straighteners, a curling iron, a hair dryer, and only one outlet is no longer an issue. Extra Earring Backs – You never know when you might need them. These tiny little things are way too easy to lose. Throw in a few of those clear, rubber backs for fish-hook earrings too. Eyedrops, contacts, contact solution – It’s a good idea to have backup contacts from everyone in the party who wears them, but at the very least pack your own. Fabric tape/hemming tape – Make sure it’s the sticky kind for those last-minute alterations emergencies that are too big for a few stitches with a needle and thread. Fake wedding rings – This may be a surprising addition to our wedding day emergency kit checklist, but believe it or not, forgetting the rings happens. A LOT. Either pack one for you and your partner in this kit, or have your maid of honor and best man wear them down the aisle. First aid kit – Avoid last-minute trips to the pharmacy. In addition to the pain relief above, pack band-aids, burn relief, liquid bandage, antiseptic, allergy medicine, and antacid. If you’re on regular medications, take back-ups. If you have a serious allergy like bees or peanuts, pack an epi pen. Glasses Case and Cleaner – If you wear glasses, you’ll want to keep them safe. You will also want to have them clean for all those pictures you’re about to take. Granola bars or other small, easy-carry snacks – Include sweet items for a sudden blood sugar drop, and savory items with protein in case you forget to eat. If you or a wedding party member has food allergies, be sure to include something safe for that allergy. Hair Accessories – This includes a brush, comb, bobby pins, hair ties/ponytail holders, hair spray, and any other product you will be using. Hand sanitizer, wet towelettes, and lotion – To keep your hands clean and soft. Bonus if towelettes are baby wipes, which work all kinds of surprising miracles. No, really – Google it. Lighter – Keep handy for candles and sealing frayed ribbons. Lint roller – Or several. You can’t have too many lint rollers at a wedding. Makeup kit – Isn’t this just as important as the first aid kit? Touch ups are essential! Make sure to include foundation, concealer, mascara, translucent setting powder, lip balm, lip gloss, lipstick, blotting papers, makeup remover, and a blush brush. Mini sewing kit – Should include sewing needles, scissors, buttons, safety pins, and thread. Make sure to include thread to match the outfits of you, your partner, and the wedding party. Nail polish and manicure set – You need clear nail polish and your day-of polish. Also pack a nail file and nail clippers. Phone charger(s) – iPhone and Android! Smelling salts – Between the possible heat and overwhelming emotion, you never know when someone might faint. Spot Remover – Stain accidents happen more often than you think. Don’t let the stain remain on your wedding dress. Plus, they make handy stain remover pens now. Straws – Drinking straws help prevent spilling and keep your lipstick perfect. Sunscreen and bugspray – Especially for outdoor weddings. Tissues and Napkins – For tears and crumbs. Undergarments – Another oft-forgot addition to our bridal emergency kit checklist? Extra pairs of clean underwear. Water – Bottled is best for preventing spills. Stay hydrated! Make or purchase an adorable tote in your wedding colors monogrammed with “Bride” or your initials to pack all of this in for that extra special touch. Then, you will have something from your wedding day that you can use again. Did we miss an essential item on our wedding day emergency kit list? Tell us what it is in the comments!